And in news that is exciting: today I'm flying out to San Francisco to meet the Nordstrom Rack team for a fun new collaboration. Follow my California adventures on Instagram! Love this on you pretty lady! Have a fun trip and hope you have a safe flight! 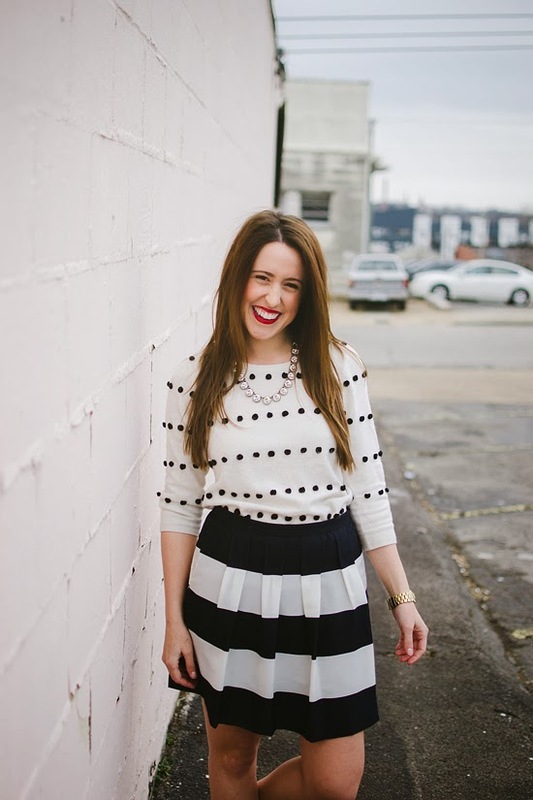 Love this simple pattern mix + that red lip! Have a fantastic time in SF! Haha twinkies. I wore this identical outfit back in September. Love the red paired with it!! Oh yay! I am in good company!! This outfit is so cute! Love how you mixed polka dots & stripes - my 2 favs! You look adorable! Love both the sweater and skirt. Perfect combo. What a cute skirt. Love the bold stripes. This is a great outfit! And I am SOOOO jealous you are going to San Francisco- I love it there! What a cute pairing...I love black and white outfits! 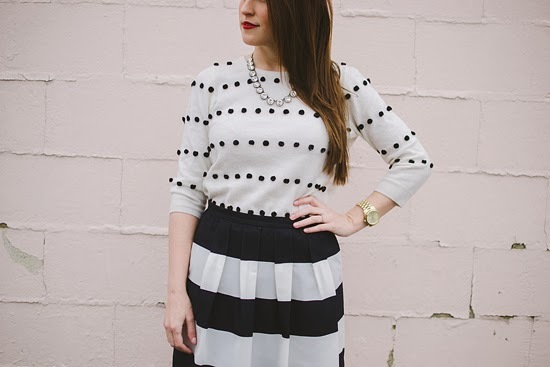 Love the dots paired with the stripes! Too cute! I need to get better about mixing prints. I always play it safe! Love the look :) Happy Monday! You look adorable...love love love the mixed prints! love this look! the print mixing is perfect! I love the mixed prints and pop of color from the shoes in this look! SO simple and cute girl! Love it! 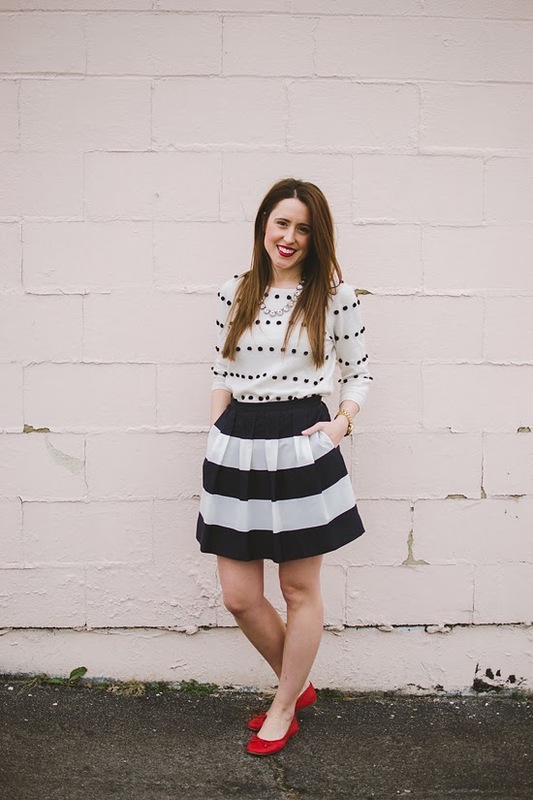 Loving this black and white pattern mixing! That sounds like a fun collab in such a great city! Hey Jessica, I love this look so much, you look so timeless and elegant and I like the fact that your outfit is still fun and fresh! I just stumbled upon your blog and I am so glad I did. I subscribed and can't wait for future posts! Such a feminine, lovely outfit. 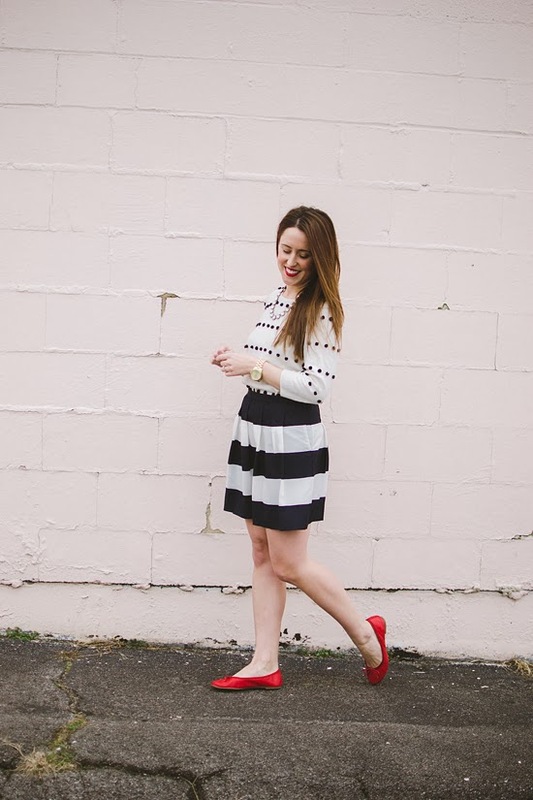 The stripes and dots are in perfect harmony and the red flats and red lipstick round up this look wonderfully! Have an amazing time with Nordstrom! definitely a great look with some awesome basics. I just saw a skirt like this at Loft that I loved! Regretting not getting it. OMG i LOVE Nordstrom's Rack! I used to go alllll the time at home, and I can't wait for us to get one here (Brentwood, right??). And you're gonna be in SF, awesome! I'll be there on Wednesday for the weekend! I wonder if we won't pass each other. Wow, Dillards one day, Nordstrom Rack the next?! You are BIG TIME!!! Congrats! Nordstrom Rack? Congrats that's amazing! This outfit is adorable. Love the pop of red! I'm still sad I don't have this top... LOVEEE the adorable print mix and have fun in Cali! Slightly jealous-not gonna lie!